On Tuesday’s show, scientist and researcher Michael Tellinger discussed archaeological and genetic evidence in support of Zecharia Sitchin’s work showing that the Anunnaki created humans through genetic experimentation to serve as slaves for gold mining. Tellinger spoke of a “vast vanished civilization” in Africa– there are ancient circular structures that cover large parts of the southern half of Africa. These stone ruins, which number in the millions, are associated with the Annunaki, and gold mining operations, he contended. Further, the structures are linked by mysterious channels and roads– not a single stone structure is unconnected, and they have no doors or entrances, so they were not used as dwellings, he said, adding that he believes an advanced technology using sound frequency was involved with the structures. One of the structures in South Africa, which bears some similarity to Stonehenge, he dubbed ‘ Adam’s Calendar,’ and suggested that it’s one of the oldest human sites (at least 75,000 years), and linked to humanity’s creation. Interestingly, Tellinger said the African shaman Credo Mutwa was familiar with the site, and referred to it by a name that translates as “Birthplace of the Son,” a place where humanity was created by the gods. The Annunaki were not a benevolent species– they were very much “service to self,” Tellinger noted. He now believes that their need for gold was not to fix the atmosphere of their home world (as Sitchin argued), but to use it to form an atmospheric shield to block other intelligences from observing activities on their home planet. 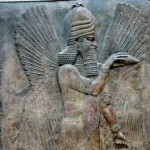 The Annunaki’s genetic work with the “entwined essence” (the Sumerian phrase for DNA) involved mixing their DNA with existing Earth species, and energy from the stone structures was utilized in their cloning efforts, he explained.